Planned refinery shutdowns for maintenance contributed to lower crude oil receipts and refinery production in April. 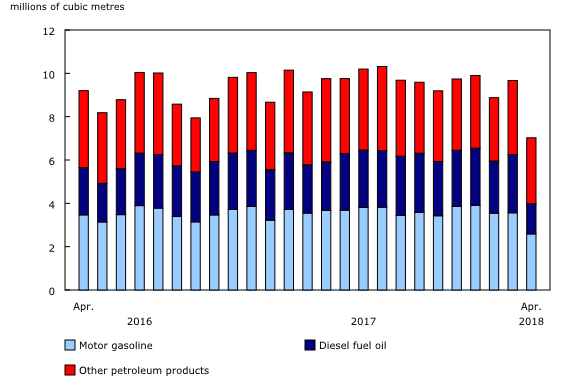 As a result of the temporary shutdowns, Canada imported more refined petroleum products in April compared with the same month in 2017. Canadian refineries received 5.7 million cubic metres of crude oil in April, down 24.5% from the same month a year earlier. Planned maintenance work across multiple refineries contributed to the lowest monthly level since 1986. Imports of crude oil to refineries were down 15.3% from April 2017 to 2.5 million cubic metres. Domestic crude oil received by refineries declined 30.3% to 3.3 million cubic metres. Crude oil inventories held at refineries totalled 3.3 million cubic metres in April, down 10.7% from the same month in 2017. Total crude oil and equivalent products used in refinery production decreased 27.4% year over year to 5.8 million cubic metres in April. Production of refined petroleum products was down 23.1% year over year to 7.0 million cubic metres in April. This was the lowest level since 1992 due to widespread refinery shutdowns for planned maintenance. Domestic sales declined 0.4% to 8.0 million cubic metres. 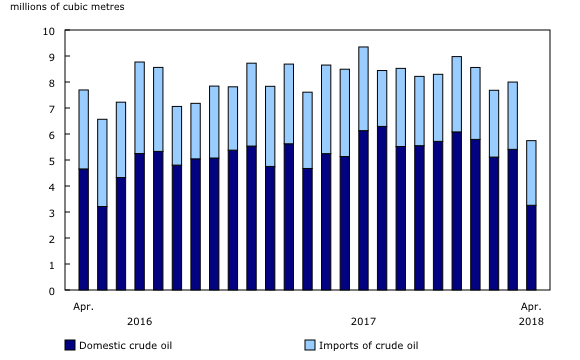 In April, Canadian imports of refined petroleum products rose 64.9% from the same month a year earlier to 2.0 million cubic metres. The increase in imports was attributable to lower refinery production. Meanwhile, exports of refined petroleum products declined 6.0% to 2.2 million cubic metres. Closing inventories of refined petroleum products held by refineries increased 5.4% year over year to 8.3 million cubic metres in April. The Monthly Refined Petroleum Products survey collects data on the activities of every Canadian refinery involved in the production of refined petroleum products (North American Industry Classification System [NAICS] 324000) and of selected major distributors of these products (NAICS 412000). Domestic sales include all sales by reporting companies, excluding exports and sales to other reporting companies. Refinery receipts of crude oil and equivalent hydrocarbons (condensates and pentanes plus) from domestic and foreign sources are for refinery consumption or storage. Data are subject to revisions.